Step four has arrived: you’ve worked out what you want, you budget and timeline, and given some thought to how you will use the studio, and how you will get it built. 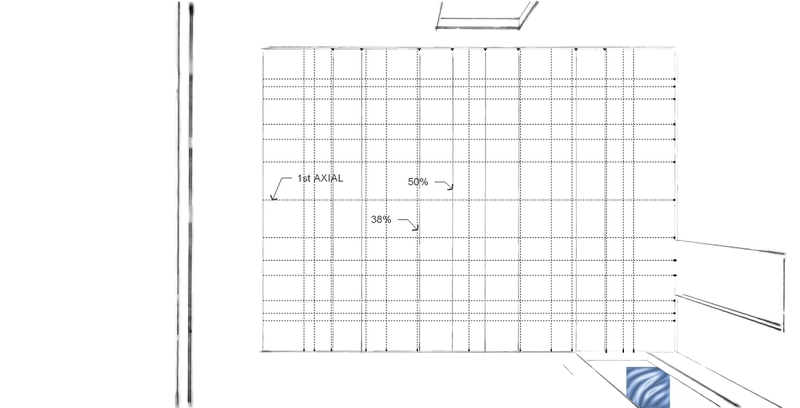 in this post, we’ll look at how to capture the relevant space in both a simple hand sketch, and then using a tool (like Google SketchUp – a free version is available @ http://sketchup.google.com/download/) to model your existing space. this sets the stage for then laying out your space and ideally having some folks comment on it (John Sayers’ Studio Building Forum (http://www.johnlsayers.com/phpBB2/index.php) is hands down the best resource for this). For our discussion we’ll assume you have a spare room in your house which you want to convert into a control room where you could also record some acoustic instruments but most of your work is done electronically into a digital audio workstation via some analog-to-digital converter boxes/mixers etc. we’ll assume that you do not plan on very loud mixing sessions (since you like your ears and only turn it up to do final tweaks), and your room is on the first floor over an unfinished basement (which for some reason you cannot use…) and is bounded by the outside wall, living room, and another room. your neighbors are about 30ft (10m) away and your ambient noise levels outdoors consist of some car traffic and little or no air traffic can be heard. since it is a project studio and not a commercial studio, and you cannot re-structure the house, you’ll make best efforts to add some isolation and keep your loud work for daytime hours when it is acceptable. otherwise you are really looking for good acoustics for mixing and the infrequent acoustic guitar or horn instrument. 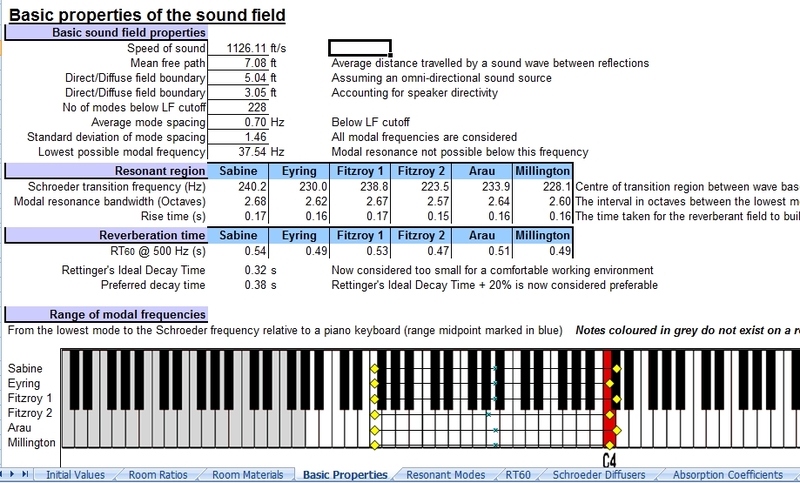 You set up your monitoring equipment and a recording which you played at 100db (based on your sound meter) (which is what you think is as loud as you intend to get) and went outside to measure how much isolation you need. except for the near (1m) window where you were reading about 85db, the overall sound level by the neighbor’s house is about 50db so you know the window needs to get some attention but overall not too bad. inside the house, the living room and other room by the closet were reading about 70db so you know you need some work. in the basement is was around 70db but it is all storage and the leakage out the basement windows is lower than the room window but you might consider some isolation under the floor since once you fix the room window the basement will be the main source of leakage. the following figure is what you drew on some graph paper. you are not too concerned with getting it scaled to match the grid lines on the paper as much as keep it neat and making sure all the measurements are accurate and all the important room retails are included. 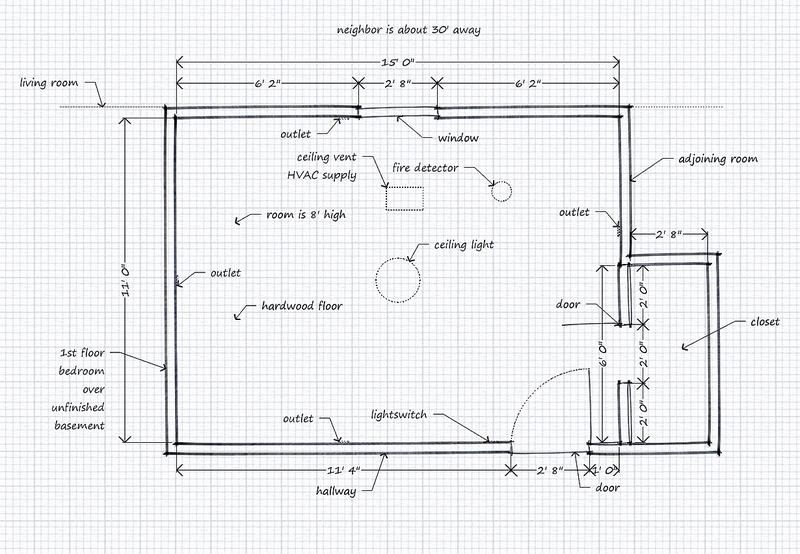 in looking at the drawing we see a few things might be missing (some measurements and a light switch for the closet) but in general it has most of the information we need to start modeling the room. one thing is immediately apparent: the HVAC uses a supply into the room and the return is located in the hallway and the airflow is under the door. 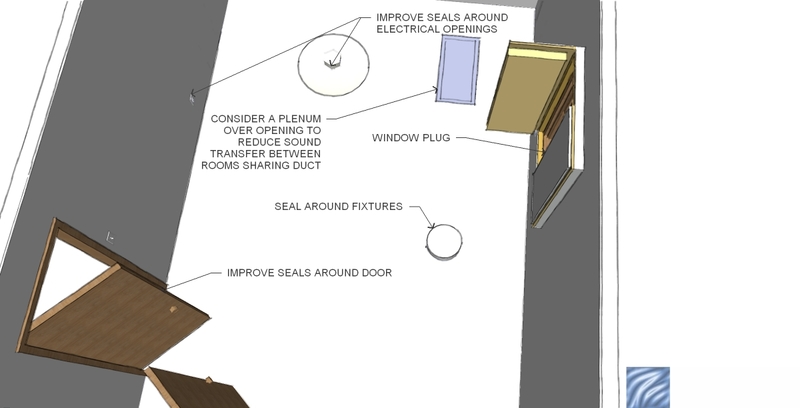 to seal the door and reduce the sound into the hallway, you may consider adding a return into the room or possible venting outside. the next step is to create a model in SketchUp (SU) or other tool (AutoCAD, etc) so you can readily visualize the design and it makes working with people online much easier. in general, start with the biggest details and work down. this means draw a box which are the main room dimensions. then add the smaller closet box and remember to factor in the partition wall when creating its depth. now you have two boxes. using the offset tool (in SU) you can expand the room to factor in the drywall, framing depth, etc. once you trim and adjust the lines to reflect a good 2D view of the room from the top, you should save that as your first template. this way if you need to re-start from that point, you can simply open up a new file based on it and re-work it. then you can add the framing, drywall, electric components, doors, etc. until your room looks like, er, your room! if this is too much detail for you, consider just working off the 2D floor plan. 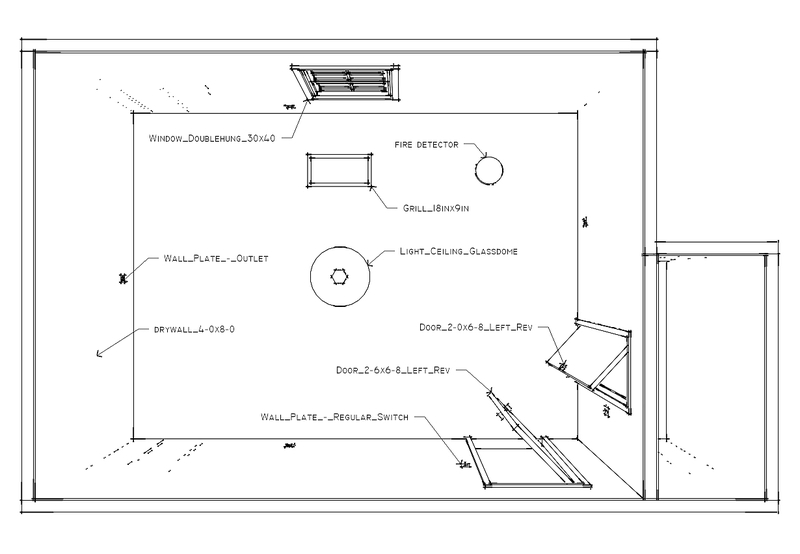 the following figure shows a good 3D view of the room including the relevant bits like outlets, light fixtures, and HVAC registers are so you can do your design around them or know what you need to move. next post we’ll start to put in some design ideas for isolation and ventilation so we can prepare for the acoustic treatments. meanwhile, get measuring! start playing with SketchUp, and start visiting and learning on the recording studio design forums! you know you want it. but you’re not a designer or acoustician. don’t know how much money you need or can get. and haven’t swung a hammer or cut some lumber. you’re a musician, producer, or just someone who wants a great place to listen to music or watch movies. without some understanding of the basics of acoustics, video, and construction, you’ll be pretty limited in how much you can achieve without getting some help. and that help is often going to cost you. money, time, aggravation, promises to be kept, and other bartering. even so, getting started in the right way can go a long ways towards having the facility you want. i’ll be skipping the whole site selection bit as thats covered in another blog, but we’ll visit the design steps a bit more. step one – do you really want to do this? are you really committed? if not, we can stop right here because you’re not going to pull it off so save yourself the frustration and find other means to get into the facility of your dreams – rent, lease, etc. step two – plan. you must figure out your market, your needs, a proposed budget, skills of the people involved, and how you’re going to get paid or pay back (yes, even personal studios need to provide value). this should be put together into a plan so you can track your progress, and if need be, get investors on-board to help. step three – if you need help and have limited (low) budget – consider exchange/barter for services, materials, recycled materials, reduction in scale/scope, etc. there are some excellent examples of people putting out advertisements for people to help build a studio in exchange for recording and mix time. one studio in LA, the owner got over 200 responses in a week. his studio was built by a handful of construction professionals (he paid for materials) in about a month. if you’re looking for investors, work with your designer to get some basic comps, renderings, and ballpark estimates (usually by taking the high level construction per square area costs X your square area = rough approximation – add another 15-25% – and then price retail on your equipment – because you’re likely to be paying installation costs even if you do get discounts on the equipment later, then another 10% of the total – worst case you’re high but its often easier to be high then to have to go and ask for more money later). step four – be there. show up everyday on site and see whats going on as your facility is built. ask questions, bring coffee or soft drinks (don’t get the crew drunk while they’re working ;-)) show enthusiasm for your project. keep your investors up to date on progress. if this is a commercial facility, start working on your marketing, you want projects lining up in anticipation of your opening. take lots of photos and keep a log of the activities. track costs and time to your plan to see where you guessed right or wrong. plan a party for the construction crew and a party for your clients/friends to celebrate opening day. step five – get to work! this is the best job in the world! if its your home theater, go relax, you’ve earned it!